Do you have recurring fantasies about transforming a humble Isetta into an octo-wheeled behemoth that can drive over or through anything, even water? And using that beast to make everyone who’s ever crossed you pay? Of course you have; you’re human. You’re also in luck, because such a vehicle exists, and it’s been found in Chelyabinsk, Russia. Of course, it’s not actually based on an Isetta, it just shares a passing resemblance because of the novel front-mounted entry door design. It actually seems to be a one-off project from the 1950s created by engineers working at the Chelyabinsk Tractor hydraulics factory. As Ivan Ivanov suggests, the new owner of the “Chelyabinsk krakozyabr”, this all-terrain vehicle is the development of Maxim Nikolaevich Melnichenko, the designer of ChTZ, who was the head of the group of hydrostatic drive of the tractor GSKB ChTZ. Approximate years of construction of the machine - 1950-1951. The design of this thing is fascinating. 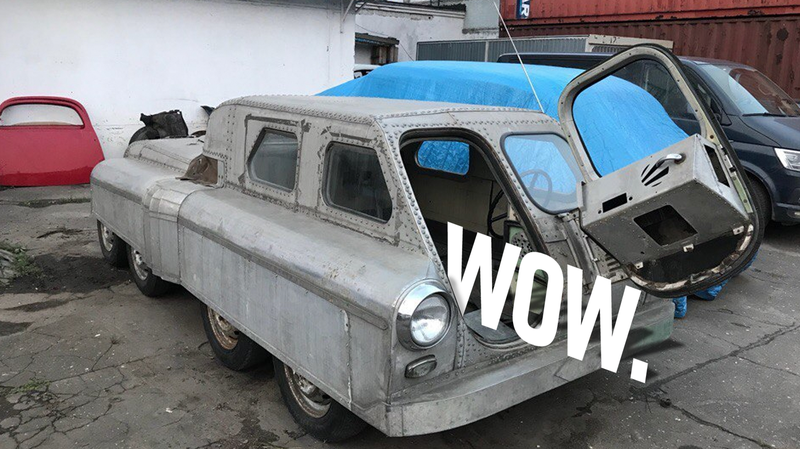 The body is all-aluminum and put together with rivets, and is covering a custom chassis with a rear-mounted engine (from a GAZ-M20 Pobeda, it seems?) that is in turn driving eight hydraulic motors, one per wheel. In addition to those eight wheels, there’s also another pair of hydraulic motors driving two propellers, for aquatic travel. Based on the design, it looks like it’s a skid-steer-type of vehicle, like a tank? Even better, the damn thing appears to be articulated in the middle, by those accordian-foldsof aluminum panels, looking sort of like the knees in a suit of armor. The two sections appear to divide the rear engine unit with the forward passenger module. This thing is amazing, but very little is really known about it still, and what is known is unverified, as this site makes a point of mentioning. I’m still pretty smitten, and the mystery just makes it even better. When I finally decide to go on my rampage, I think this is the vehicle I’d like to do it in. I guess you’ve been warned? Two Soviet car stories in one week!